transmit products into the web frontend where you can further edit them. updating) do support WiFi, we really only support GSM because that means we don’t have to share the end users infrastructure. customer’s infrastructure, no matter how crappy the proxy, no matter the IDS in use, we’ll always be able to communicate with our server. to add a “transparent” (do note the quotes) proxy to the mix. We were quite stomped last week when we got reports of an HTTP error 408 to be reported by the mobile devices, especially because we were not seeing error 408 in our logs. Strange: Client is showing 408, server is seeing a RST from the client. HTML formatted error message by a proxy server. Do note the “DELETE THIS LINE” and “your organization here” comments. – that just takes a while. just us – see my remark about long polling). connection can’t be messed with. goes through nicely using HTTPS. connection. Something f’ing up your WebSocket connection? Use SSL! arbitrary numbers in your response with asterisks (yepp. happened too)? You guessed it: Use SSL. connection, faking a certificate using their trusted ones. non-authorized third-party messing with you. on a web server in order to do user authentication. completely unusable for normal people. be using in a setup where clients talk directly to your application. need in the “Certificate Assistant” submenu of the application menu. private key) in order to sign their public key. own certificates you have signed for them. above CA will be allowed to access your server. really nginx who set it and not a client faking it). I’ll talk about what you do with these variables a bit later on. Apache will also set many variables for you to use in your application. issued). The full certificate is in SSL_CLIENT_CERT. pass in some options. One is requestCert which you would set to true. format which is your CA’s certificate. looking at the client.authorized property of your request object. then the question is what you are going to do with that information. serial as a key to look up the user data. depending on your use-case use one or both. you cannot safely have only parts of your site require a certificate. where the client certificate can be preinstalled silently. needed. Your web server can do everything that’s needed. they are properly signed by your CA. to log in as any user. 2001ish and that was only for internal use. your certificate authority and have your web server check that. client certificates might be totally foreign to them. But if it works for you, perfect. Of all the things that can be wrong in a SSL certificate, this certificate manages to get them wrong. The self-signed(1) certificate was issued for the wrong host name(2) and it has expired(3) quite some time ago. 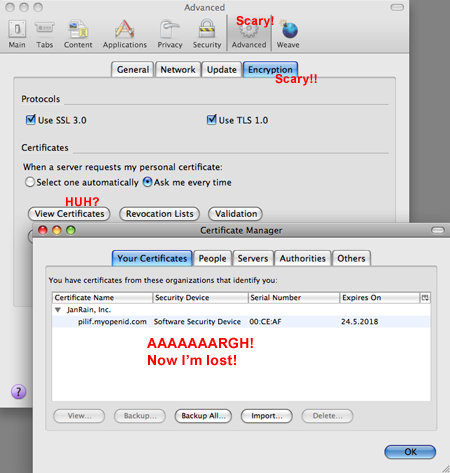 Granted: In this case the issue of trust is more or less constrained to the server to know who I am (I wasn’t intending on transferring any amount of sensitive data), but still – when you self-sign your certificate, the cost of issuing one for the correct host or issuing one with a very long validity becomes a non-issue. Anyways – I had a laugh. And now you can have one too.